On my Total Lunar Eclipse report I mentioned that my 2-year old iOptron SkyTracker Pro didn't work for the Eclipse, although it had worked fine after being fully charged for my Eclipse dry run on Friday, 18 January. I checked the battery on Monday, 21 January, and it was fully charged. And there was no obvious obstruction that would prevent the Tracker from tracking. There was just no motor movement or motor sound. I contacted iOptron technical support and got a response later that day. They sent the simple steps to reset the encoder, which worked. Thanks iOptron! Monday was windy and mostly cloudy after sunset. 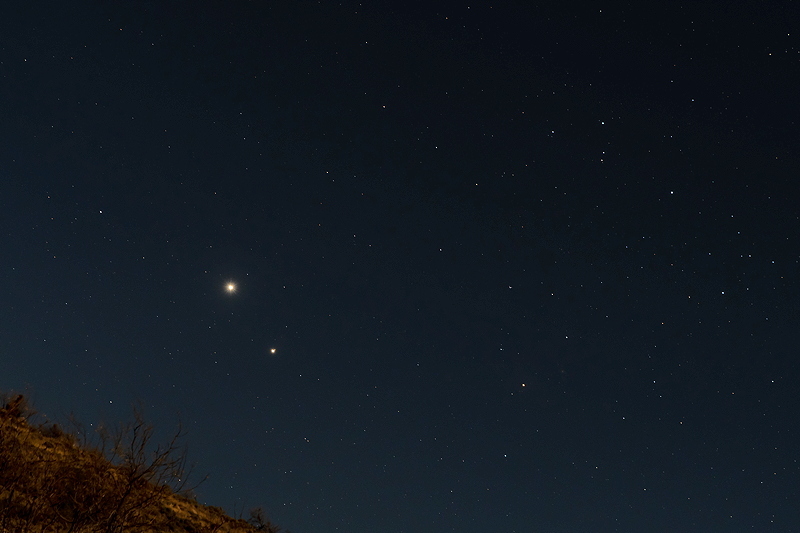 I got up early Tuesday morning, 22 January, to photograph the conjunction of the planets Venus and Jupiter. They were separated by 2° 24'. The sky was mostly clear and the outside temperature was 34°F. I set up the SkyTracker Pro with my D850 DSLR, 24-70mm lens, and 150-600mm lens on the house back patio. This photo (f/4, 10 seconds, ISO 800, FL 55mm) shows the planets rising over the hill to the southeast (illuminated by the waning gibbous Moon). Part of the constellation of Scorpius is at the right. 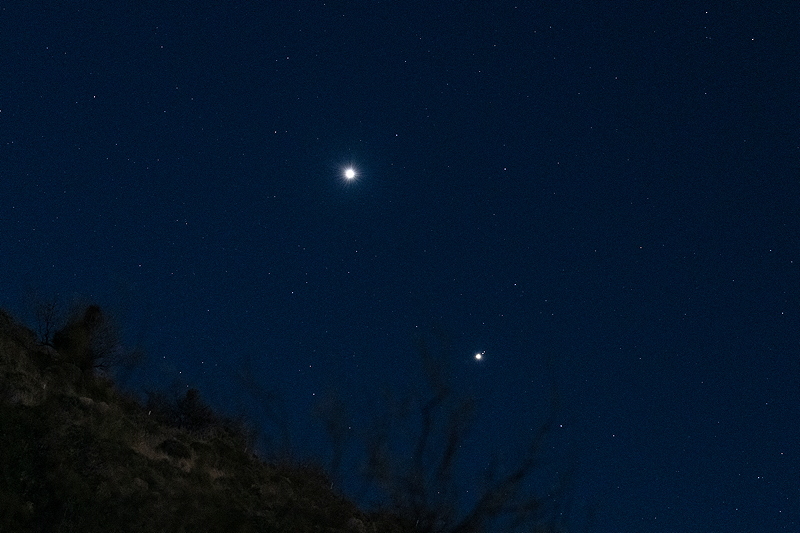 This photo (f/5, 1 second, ISO 1600, FL 150mm) shows Venus and Jupiter. Two moons of Jupiter are visible near the planet. Lastly, this cropped photo (f/11, 1/4sec, ISO 800, FL 600mm) shows Venus at the left (overexposed) and Jupiter and three moons (top-to-bottom: Callisto, Ganymede, Europa) at the right. All images were tracked using the SkyTracker Pro.